The Solutes and Solubility CELL gives students the opportunity to investigate differences in the solubility of several different chemical compounds by dissolving the solid solutes in a liquid solvent, water. Students are given the opportunity to explore the concept that solubility is a property that is specific to each different solute. Students also explore how physical agitation and elevated temperature increase the rate of solubility. Through experimentation and data collection, students answer questions such as: What affects the solubility of a solute? Is there a relationship between the concentration of a solution and the saturation point of a solute? 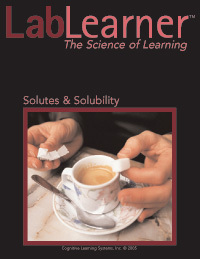 Can the rate of solubility of a solute be changed? Understand the difference between a solution and a heterogeneous mixture of undissolved solute in a solvent. Recognize that solubility is a physical property specific to several different chemical compounds. Recognize that solubility is not dependent on which elements are present in a compound. Explore how physical agitation increases the dispersal of a solid solute and increases its rate of solubility. Recognize that solubility depends not on which elements are present in a compound but on their combination. Explore how increasing the temperature of a solution increases the dispersal of a solid solute and increases its rate of solubility. Use the concept of concentration to express the solubility of chemical compounds.